The FBI and their magician consultants go after an Venezuelan spy (Victoria Cartagena) who takes her sweet time in setting up a revenge against every CIA agent involved in a classified operation that got her team killed. The theft of a top-secret piece of technology and luring the FBI in to arrest her provide the spy with the names of the agents involved in the mission. It just so happens that one of those agents is the ex (Brett Dalton) of FBI Agent Kay Daniels (Ilfenesh Hadera). 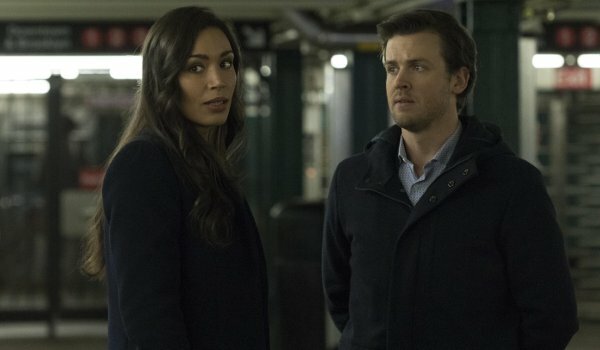 Watching the awkwardness between the pair makes the Amazing Cameron Black (Jack Cutmore-Scott) realize he has been deceiving himself about his feelings for Kay (although the show still has work to do to sell me on chemistry between the two). Kay's scenes with her ex seem mainly in place to push Cameron into investigating his own feelings. The spy scenes, including the initial theft and the gun built from hundreds of pieces (and returned to that same state) prove to be far more interesting. While the episode lacks the team performing a major deception to catch a bad guy to close the episode, they do help nab the sniper and save one of the names on her hit list by tricking the sniper into shooting when her target was seemingly the most vulnerable (but was actually completely safe). The episode's B-story, in which Jonathan (Cutmore-Scott) convinces Dina (Lenora Crichlow) to make a small betrayal of her new boyfriend backfires for everyone as it allows the mystery woman to get her hands on the diamond. With the Deception team still in in the dark about what mystery she is trying to solve, they have now fallen dangerously far behind as she has acquired the final piece to her puzzle. And there's little doubt that Dina's actions will have larger ramifications than just getting Mike (Amaury Nolasco) temporarily suspended from duty.